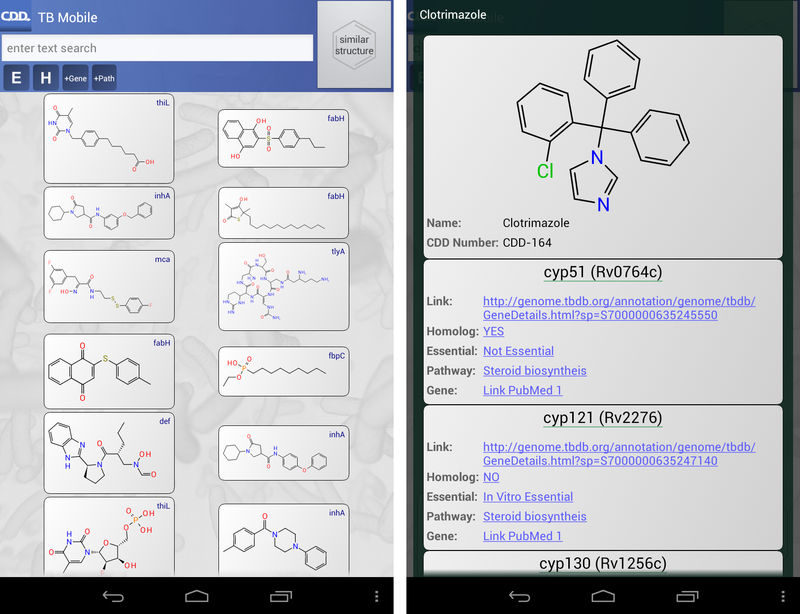 A blog about chemical information software for next generation computing environments. The TB Mobile app is soon going to have an Android version too. Originally released for iOS (October 2012), work began on the Android version not long after. The user interface of the two apps is essentially the same, with a few minor stylistic differences on account of it being a different platform. The two screenshots to the right suggest that the app is almost feature complete, which is indeed the case. There remains only some peripheral functionality, followed of course by testing and a general going-over to tighten up the look’n’feel. When it’s ready, the app will be released on Google Play, and be freely available. It will run on pretty much any Android device, as it is compiled against the 2.3.4 version of the operating system, and adapts to a variety of form factors.